Studies have shown 3-day old broccoli sprouts contain 10-100 times the amount of glucoraphanin than that found in mature broccoli. Glucoraphanin is an anti-cancer compound that helps the body detoxify environmental pollutants. 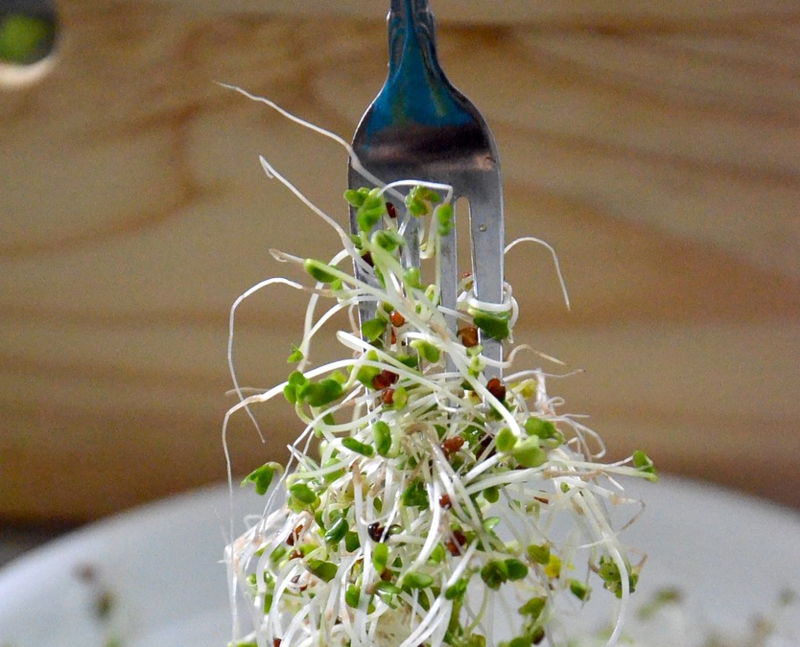 Broccoli sprouts also contain an incredibly healthful compound called sulforaphane. Sulforaphane has been shown to help normalise DNA methylation, act as an anti-cancer agent, benefit our liver detoxification pathways, play an important role in activating over 200 genes in the body, may protect our brain, protect our eyesight, protect against free radicals and help to treat cancer (specifically breast cancer). However, sulforaphane requires an enzyme (myrosinase) as a precursor in order for the sulforaphane to be produced, and myrosinase is easily lost in the cooking process of broccoli, making sprouts a better option, since they’re consumed raw. Broccoli sprouts also contain isothiocyanates, which are cancer preventative and they have been shown – in clinical trials – to be an effective complementary treatment for diabetes and to reduce oxidative stress, inflammation and insulin resistance as well as fasting blood sugar levels. Two-and-a-half ounces of broccoli sprouts daily for two months has been shown to be potentially protective against Helicobacter pylori (H. pylori). Additionally, a team at Johns Hopkins found that a daily serving of broccoli sprouts reduces a marker for the presence of H. pylori by 40%. This same Hopkins team discovered that sulforaphane is a potent antibiotic against H. pylori. I love consuming broccoli sprouts or broccoli sprout powder because you get significantly more bang for your nutritional buck verses eating actual broccoli (and, you’d have to eat a huge amount of real broccoli to even come close to the nutrition in broccoli sprouts). Having said this, research published in 2011 suggested that eating both broccoli and broccoli sprouts might double the anti-cancer effects than each can have on its own. My family and I pretty much eat steamed broccoli every single night, and I try to eat broccoli sprouts and/or broccoli sprout powder every day. If I forget I’ll actually put a teaspoon or so of broccoli sprout powder into some water and shoot it back in order to get the nutrition into me, (gross, but you gotta do what you gotta do!). I highly suggest you make broccoli sprouts or sprout powder part of your daily nutrition routine. It’s definitely something I tell all my clients to include in their diets as much as possible. Hey Anne! Great to hear you’re going to add sprouts to yours and your family’s diet. I sprout my own. I purchase broccoli sprout seeds from a health food store and then as per the package instructions I sprout them in a mason jar in my kitchen. Easy peasy. To be honest, I’ve not tried feeding these to my kids yet. My husband and I eat them by the handful, in smoothies, on salads, on eggs or even atop soup. Enjoy!